Production Time: 7-14 days, sometimes quicker depending on our current workload. Shipping: USPS 1-2 Day Delivery. **IMPORTANT** We can ship overnight, if needed. Please contact us prior to purchase to arrange for correct shipping charges. Where to display: Each sign comes with a sawtooth hanger, and can easily be hung on walls or set on top of fireplace mantels, etc. Colors: Many states are painted with the officially licensed colors of your favorite team. For those that are not, we work carefully with our supplier to color match as precisely as possible. Heart Location: Athens, GA. Contact us if you'd like it moved to a different location. Special Occasion Wrapping Paper: FREE OF CHARGE! We're happy to wrap any purchases intended as gifts, as well as include a handwritten card, if so desired. Contact us via convo, or simply type in any requests in the comments box during checkout. 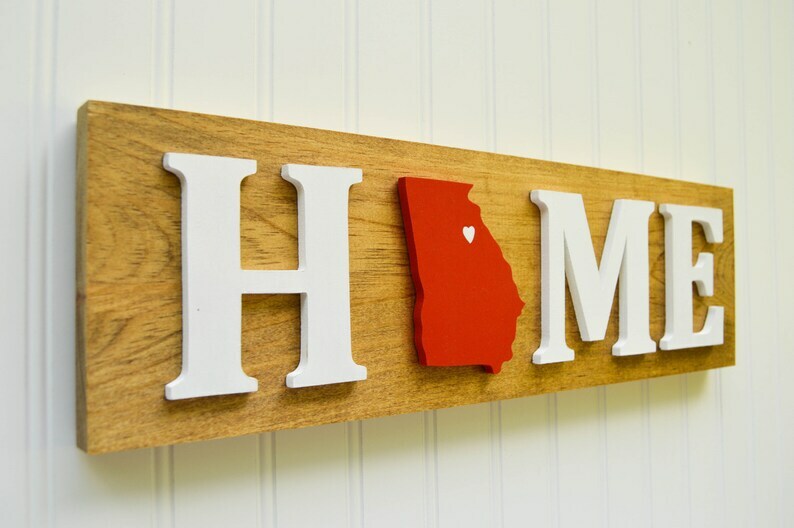 - We're happy to accommodate several different custom requests regarding the "Home" signs. Examples include: Reversed colors on the state, relocation of the heart on the state, and custom letter colors. What a beautiful piece of work. I’m absolutely in love. Fast shipping too! Thanks so much! Quick turn around, great craftsmanship, and fast delivery. We accept PayPal and all major credit cards (a PayPal account is not required in this case). If you have any trouble with the checkout process, please contact us and we'll be happy to help you out with anything. If you are unsatisfied with your purchase in any way, please contact us as soon as possible after you've received your order so that we can work to make things right. Occasionally things go wrong, and an item may be damaged in transit. If this happens, all we require is a picture of the item, and then we'll send you a brand new one to replace it.....that's all it takes! If for any reason you need to return your order, you will be responsible for returning items in their original condition, as well as for the return shipping costs to us. The original shipping fee is non-refundable. We currently ship all orders via USPS. * Most items are shipped Priority Mail 1-2 day delivery. Standard post (3-7 days) is used for shipping State Heart Magnets in order to keep your shipping fee as low as possible. However, you may request Priority Mail shipping for your magnets if so desired. * Expedited shipping is always an option for any order. If you would like this service, please send us a message BEFORE PLACING YOUR ORDER. We will be happy to set up custom listing for you to revise the price. we can make the correct changes to the order. shipping boxes and/or padded envelopes unless otherwise requested. * Delivery standards to ALL destinations are estimates, NOT guarantees. Sometimes it may be less, or it might take a few more days due to many different reasons (border/customs, world events, holidays, weather, etc.). If you have a firm "need-by"date, always message us BEFORE placing your order. * Shipping does not include insurance (otherwise it's indicated into the listing). If you would like faster shipping, tracking or insurance, let us know and we'll give you an estimate. * We cannot be responsible for lost item due to a wrong address given by the customer or USPS error. Please, make sure your shipping address is correct. Damaged Items - We always carefully package each item out. With that said, unfortunately once it leaves our possession it becomes the responsibility of the U.S. Postal Service to deliver it safely and on time. and we would be happy to discuss further shipping options. working on changing that REAL SOON! Q: "Is every state actually handmade?" Q: "Is the wood you use suitable for outdoor display?" specifically designed and created for indoor display only. Q: "Can you make custom State Hearts for my son/daugther's high school team?" things which we'll need to work together on. all that is needed to make your custom team State Heart! Q: "I don't see my favorite team. Are you gonna sell it in the future?" college and/or professional team for every sport in the world! fun talking sports with like-minded fanatics!